A century from Kusal Perera helped Sri Lanka complete a 2-0 series victory with a 136-run win over Ireland in their one-day international at Malahide. The tourists had been put into bat, and made good use of a run-friendly wicket with an imposing 377 for eight from their 50 overs. After Perera and Danuska Gunathilaka, who made 63 off 78 deliveries before being run out, had put on 147 for the opening wicket, Seekkuge Prasanna contributed 95, his best one-day total, to help put Sri Lanka in control. By the time Perera was eventually out, caught by Paul Stirling off Tim Murtagh, in the 42nd over, Sri Lanka had pushed on to 309 to leave Ireland facing a testing run-chase. Murtagh was the most successful of the Irish bowlers, with three wickets for 66 runs from his 10 overs. 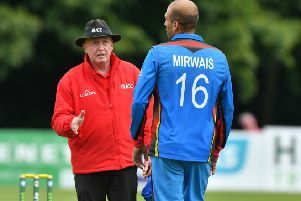 In reply, Ireland’s top order, though, failed to make an early progress, as opener William Porterfield went for eight and number three Ed Joyce for nine. John Anderson scored 34 and Stuart Poynter 36, before Andy McBrine came in at number eight and promptly hit 79 off 64 balls, including seven fours and two sixes. However, Sri Lanka’s total never looked in any real danger and Suranga Lakmal helped finish off the tail, ending with figures of four for 38.